(h) “Rivers District” means the City of Calgary Rivers District community revitalization levy area established pursuant to section 3. 2(1) This Regulation applies only to property located in the Rivers District. 3 This Regulation establishes a community revitalization levy area in the City of Calgary, known as the Rivers District, on the lands described in the Schedule. (c) make and keep a record of any public hearings and make the results of the public hearings available to the public. (m) the expected role of private sector developers in the redevelopment of the Rivers District. 7 Assessments of property in the Rivers District must be prepared in the same manner as similar properties in the municipality in accordance with Part 9 of the Act, as modified by this Regulation. 9(1) A community revitalization levy roll may be a continuation of the tax roll prepared under Part 10 of the Act or may be separate from that roll. (2) A community revitalization levy roll must show the same information that is required to be shown on the tax roll in accordance with section 329 of the Act. 11(1) The amount of the levy to be imposed in respect of property located in the Rivers District is to be calculated by multiplying the incremental assessed value for the property by the community revitalization levy rate to be imposed on that property. C is the community revitalization levy rate to be imposed on that property. (3) The levy under subsection (2) is to be applied beginning in the year that the property becomes taxable. (4) If a tax exempt property in the Rivers District becomes taxable, the assessment baseline for that property shall be excluded from the equalized assessment beginning in the year that the property becomes taxable. (5) If a taxable property in the Rivers District becomes tax exempt, no levy is to be applied to that property beginning in the year that the property becomes exempt. (b) be used only for the purposes specified for the Rivers District. (c) the incremental assessed value within the community revitalization levy area for the year and previous years. 15 This Regulation expires on December 31, 2027.
commencing at a point where the left bank of the Elbow River intersects with the west side of 1st Street S.E., north along the west side of 1st Street S.E. to where it intersects with 7th Avenue S.E., then westward along the south side of 7th Avenue S.E. 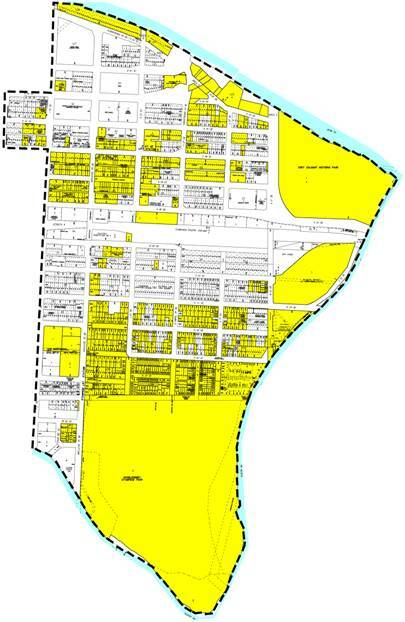 to Centre Street, northward along the west side of Centre Street to 5th Avenue S.E., eastward along the north side of 5th Avenue to the intersection with 1st Street S.E., then northward along the west side of 1st Street S.E. to a point where, if extended northward, 1st Street S.E. would intersect with the right bank of the Bow River.